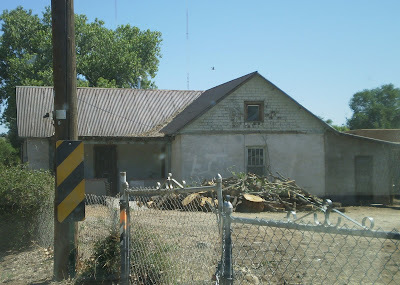 This is a photo of an old adobe house a few blocks from me. It was overgrown and really cluttered. One day I saw a For Sale sign and called on it right away. Not that I would be able to buy it, but I'm always imagining sweet little places that I think would make a great home for a working studio and small gallery of my work. They would never call me back about the house, and then one day, people swooped in, cut all the trees, carried off all the junk and really cleaned up the house. I'm wondering what's going to happen to it now. I want it!! 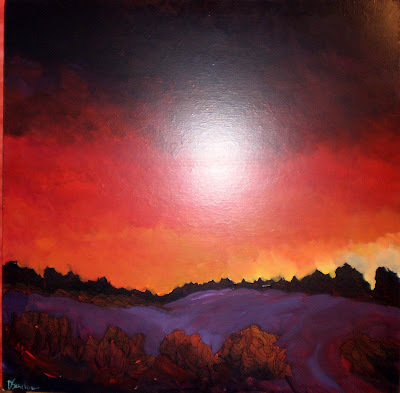 This piece is a 30"x30" older painting (one of two that I found in the back room of the gallery a few days ago). Love the red in the sunset. Hollyhocks in my neighborhood. These are at a little bitty house on 4th street. 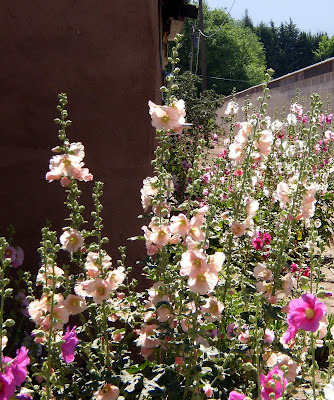 All of the hollyhocks and a lot of other flowers are in full bloom now. Tomorrow is a photo-taking day at Old Town and any other flower-blooming sites along the way. Tomorrow I will also be gathering canvas and supplies to finish some commissions and start on some small lavender paintings for the upcoming LAVENDER IN THE VILLAGE festival. I hope to also have a new daily painting available. Have a great Sunday!